Although Rolland F. Perry City Forest and the surrounding Bangor Land Trust preserves may not exactly be in the remote regions of the Maine wilderness, it’s a good idea for visitors to take some precautions when planning a day on the trails. Make sure you know where you’re going before you head out on the trails. And make sure you know how to get back. If you haven’t been on a particular trail before, bring a map. Hikers and bikers get lost out here more often than you might think, especially when they venture off the Veazie Railroad bed or explore trails that connect the Northeast Penjajawoc Preserve and Walden-Parke Preserve to City Forest. 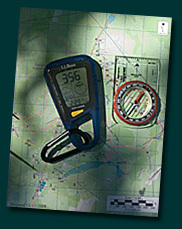 Not only should you bring a map, you should also bring a compass. You may not necessarily end up wandering for days if you get lost, but you may very well find yourself roaming around in the dark. This is why it’s also important to bring a flashlight or head lamp if you think you may be out near sunset. Not only will having a light help you see when darkness sets in, it will also help mountain bikers see you. Carry some form of a first aid kit. At the very minimum, have some bandages, if not a first aid kit you can fit in your pocket. 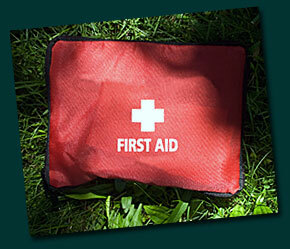 You may end up needing minor first aid if you stick your finger on a thorn or splinter, suffer an abrasion if you fall off your bike, or twist an ankle while hiking over uneven ground. If you or your dog have an unfortunate encounter with a porcupine and get stuck with quills, don’t try to pull them out until after you cut them in the middle. Porcupine quills are barbed on the end and hollow inside. When they become embedded in flesh or muscle, a vacuum forms inside the quill. Cutting the quill in half will release the air pressure and make it easier for you to gradually pull the quill out. Wash the area with soap and water or an antiseptic to prevent an infection. Wear sun screen if you’re going to be hiking between 10 a.m. and 3 p.m. in the spring and summer. Although most trails are well-shaded, you may find yourself walking in direct sunlight. It’s better to be safe than sorry. If you plan to be on the trails for a couple of hours or more, bring some water, especially if you’re heading out on your bike on a hot and humid summer day. None of the water you will find in the beaver ponds, streams, and brooks is safe to drink. Use bug spray. Nothing ruins a pleasant spring or summer day on the trails in the Maine woods than the unrelenting attack of mosquitoes. The area’s topology makes it a prime breeding ground for mosquitoes, especially along the Veazie Railroad bed. Insanity is sure to ensue for the fools who think they can endure a few thousands of bites. Some areas of the forest are home to deer and horse flies, whose bites are much worse than a mosquito’s or black fly’s. 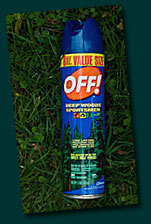 Deep Woods Off Sportsmen is by far the best bug spray. Spray exposed skin on your arms and legs – leave nothing untreated. Wear a hat t keep mosquitos out of your hair. To apply insect repellant to your neck and face, spray it on the back of your hand and wipe it on. Avoid getting repellant near your eyes and lips. Also avoid getting repellent on the inside of your hands, as repellant can smudge plastics and paints. One of the biggest dangers in the forest isn’t being attacked by an animal; it’s being sucked on by a tick. The deer tick can transmit Lyme disease. Bangor is in an area of the state known for having a “moderate” number of deer ticks, according to Maine Center for Disease Control. Dog ticks, which do not transmit Lyme disease, are also prevalent in the area. To minimize your risk of attracting ticks, wear light-colored clothing and tuck your pants into your socks for maximum protection. Of course, wearing pants isn’t practical during the hottest weather. Apply insect repellant containing DEET to exposed skin. Have you vet give your dog a Lyme disease vaccination. When you return home from your outing, inspect your exposed skin, clothes, and hair for ticks. Ticks like to hang out on grass and hitch a ride with an unsuspecting passerby. If you find a tick on you, remove it as soon as possible using tweezers. Grasp the tick as close as possible to your skin and pull gently until the tick releases its hold. If you suspect you have removed an engorged deer tick, consult your doctor. It may seem obvious there is wildlife in City Forest and the surrounding preserves, but some people don’t quite understand this. It shouldn’t be news that black bears and great horned owls forage for food here. With this in mind, remember that there is no wildlife in the forest that wants to hurt you. If a black bear approaches you and does not appear to fear you, simply talk to the bear. Failing that, wave your arms. Failing that, clap your hands, shout, or blow a whistle. Stand your ground. Do not run or try to climb a tree, or flee on your bicycle. A black bear can reach speeds of up to 35 mph and is an excellent climber. Do not cower. You must show dominance. If you see a bear and it does not approach you after noticing you, you don’t need to do anything. Just stay where you are and enjoy the show. Or keep walking or biking. In the extremely rare event you are attacked by a black bear, fight back. Playing dead is a strategy for dealing with a grizzly bear, not a black bear. If you encounter a porcupine, there’s nothing to worry about. 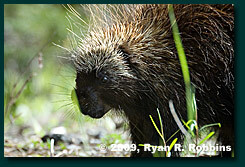 Porcupines cannot “throw” or “shoot” their quills. The only way a porcupine can embed its quills into you is if it hits you with its tail or you otherwise contact the quills on the ends. There do not appear to be any skunks in the forest, as they tend not to dwell in dense woods. Should you encounter one, it’ll likely be on the edge. Before a skunk sprays, it will warn a potential threat by raising its tail and flicking it while hissing. A skunk’s spray has a range of about 15 feet. Raccoon and fox sightings are even rarer than black bear sightings in the forest. Never approach an animal that appears disoriented or is foaming at the mouth, as these are symptoms of rabies. Never attempt to touch any form of wildlife. If you encounter a sick or injured animal, leave it alone and call the Maine Department of Inland Fisheries and Wildlife, at (800) 432-7381. Lighting strikes do happen and have happened in City Forest. 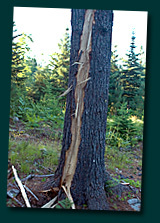 Don’t wait until the first flash of lightning before heading back to the car. That first flash just might be the last thing you see. If you so much as hear a rumble of thunder, it’s time to seek shelter. If you find yourself deep in the forest and far from your vehicle, the terrain you’re in will determine what you should do. If you’re out in the open, get down as low as possible to minimize the chance of lightning choosing you as its path to the ground. If you’re near the woods, go there instead, again making yourself as low as possible. Don’t position yourself directly next to a tree, though, and avoid being next to tall trees. Seek the lowest grove of trees for cover. If you’re biking, get off your bike and stay away from it, as metal is an excellent conductor of electricity. Large tracts of the forest and surrounding areas are year-round wetlands. Make sure ice is thick enough to hold your weight before venturing out on it. Some of the wetlands are more than a few feet deep. If you should fall through the ice, don’t panic. Try to roll yourself onto the surface and then roll or crawl to safety by maximizing your body’s surface area on the ice to spread out your weight distribution. Dress warmly and in layers and make sure you have plenty of daylight left before heading out if you don’t know the trails. If you do know the trails and may find yourself out after sunset, bring a headlamp. Skiers need to remember that it’s much more difficult to judge the terrain when darkness has set in, so ski at an appropriate speed. � 2001-2009, Ryan R. Robbins. All rights reserved.